"IF U WANT U CAN" the best message given by President awardee Poonam Shroti in a motivational session conducted by Sagar Group of Institutions on Tuesday. She is an inspiration for the people who give up in life and procrastinate . She is suffering from an incurable disease OI (Osteogenesis Imperfecta) since birth. 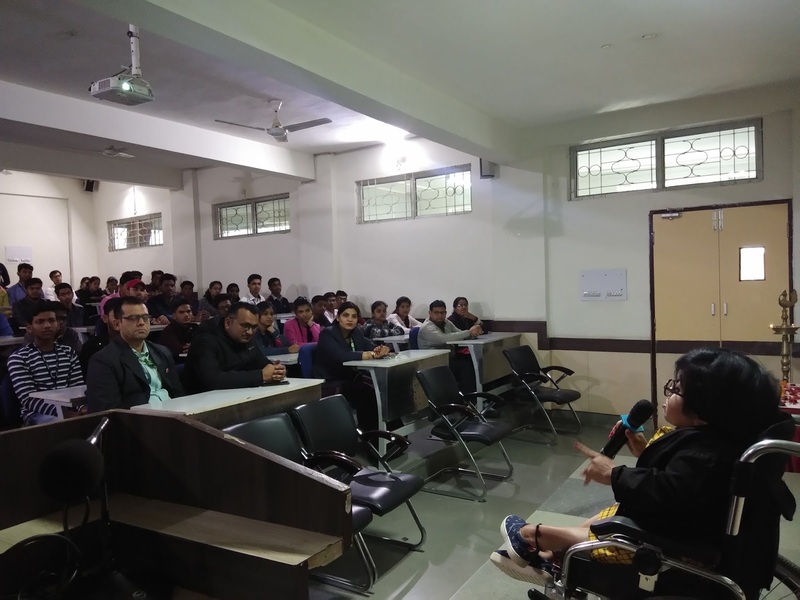 A social worker, an entrepreneur and working for specially abled persons, Poonam spoke on self motivation, negative motivation, soft skills, determination and overcoming fears to the students. "I faced more than fifty rejections during her placement. I believe in self motivation and negative motivation. If someone challenges me, I whole heartedly accept the challenge. At any given point of life you feel like giving up, think of my story. You will never feel low again," she said. Talking to the students about the importance of soft skills she said, "Soft skills are important for any management student, but equally important is focus. If you linger around your focus gets disturbed which ultimately delays your output." Further speaking about the herself she said, "Despite the physical problems, my attendance during school and college was more than a normal person. When I joined my first job, my salary was merely Rs. 6,000, which is nothing in today's time. Every time, I had to prove myself more than an average individual throughout my life." The session was attended by approximately 85 students and faculty members of the institution. Poonam is just little over two feet but her tiny structure never stopped her from positively impacting life of others. Osteogenesis Imperfecta is a disease in which bones become so weak that it can be fractured any time, but being so small she has done so much which a common person can't even imagine to do. She is a double MBA in finance and Human Resource Management. Presently she is working for the upliftment of the specially abled through her organization Uddip. She is also providing skill development training to the differently abled to make them self dependent.